طبق ساتيه بيعتبر واحد من الأطباق الوطنية فى اندونيسيا وبرضه فى ماليزيا وسنغافورة، وتايلاند، وشويه فى هولندا. A Sunday roast—in this example, consisting of roast beef, mashed potatoes, vegetables and mini Yorkshire puddings—is a national dish of England. Hainanese chicken rice, a national dish of Singapore. 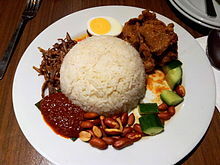 Nasi lemak is a national dish of Malaysia, served with anchovies, peanuts, boiled egg, lamb curry, cucumber, vegetables, and "sambal tumis" (hot spicy sauce). Pierogi ruskie ("Ruthenian dumplings"), the most enduring of Polish culinary traditions, recall the Ruthenian culinary traditions of the former Polish eastern territories (Kresy), a national dish of Poland. جمهورية الدومينيكان - لا بانديرا ("العلم") الأرز والفاصوليا الحمراء واللحوم (لحوم البقر والدجاج ولحم الخنزير، او السمك). الولايات المتحدة - فطيرة التفاح، همبرغر، الديك الرومي المشوي.